Ever see an ad and immediately recognize the era it came from—not from the content, but simply from the style? This looks like a lot of ads I've seen from the 1970s and early 80s. The only thing which surprises me is that it's for a Nikon camera, not Cokin filters. 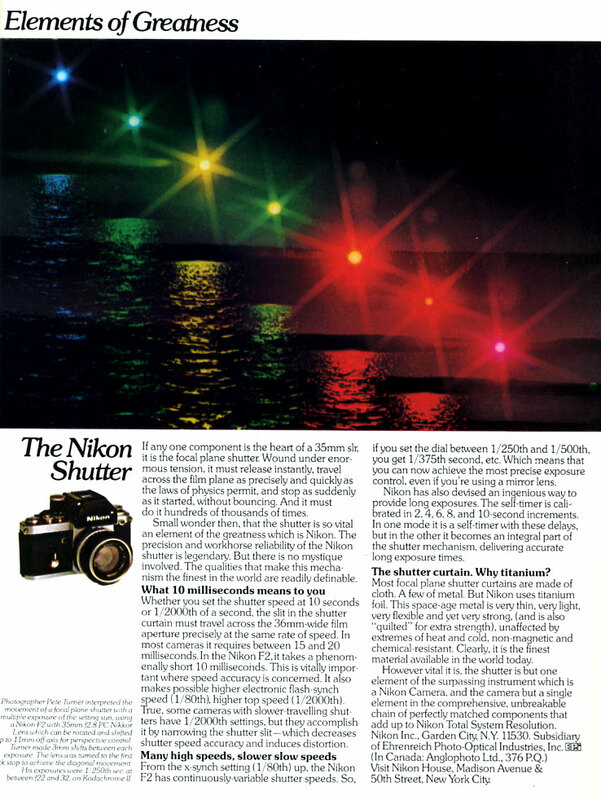 This is pretty much the Omega to the Alpha advertisement for the Nikon F—what a difference. Toward the end of its run, Nikon ran a lot of ads for other Nikon equipment and concepts, rather than just a huge photo of the camera itself. By this time, anyone who cared would recognize the venerable F from just a thumbnail. They needed something unusual to break themselves away from the pack.